Hi, I’m Jim Murphy and I recently joined Friends of Scotchman Peaks Wilderness. This is my first blog. 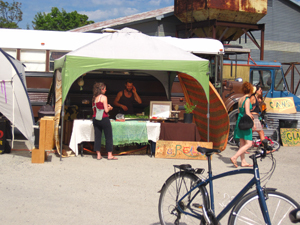 If you weren’t at the August 13 Eco-Fair in Sandpoint, you missed a great adventure. When you walked into the Fair, you were warped back into the 70’s, complete with tie died shirts, pony tails, Birkenstocks and an old converted school bus. There was entertainment for all ages, chalk sidewalk art and crafts for kids, organic and natural foods, and make up, pottery and art. Orin, the owner of the converted school bus, provided an array of organic foods including sprouted flax chai crackers, kale slaw (a crowd favorite) and a yummy rice, bean and greens dish. While wandering around I found a delectable zucchini salsa provided by Shari Heki of Ponderay, ID and the most incredible natural granola bar made by Jennifer Ott from Sandpoint, ID. Jennifer’s baked goods are available everyday at Evans Coffee roasters. The people at Evans Coffee Roasters provided an amazing menu of coffee beverages and free water for humans and pooches. 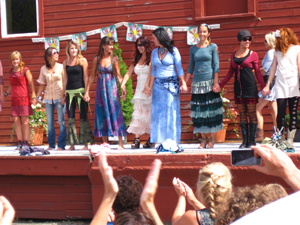 A fashion show was provided by Franny, owner of Altered Eco, Re-Designed Fashions and Accessories and fair organizer. You can email Franny at franny111@verizon.net for more information. The event also included several choreographed dances, a Zumba presentation and a Belly Dance. The Friends of Scotchman Peaks were well represented by Sandy Compton, Phil Hough, Deb Hunsicker, Andy Kennaly, Gary Payton and Jim Murphy. We signed up new friends and greeted old friends, sold some swag and had a good time. Jim Murphy joined the Friends of Scotchman peaks through a program called Experience Works on August 1, 2011. Jim’s background is varied and has 30 years experience as finish carpenter and cabinet maker. He is excited about our efforts to have Scotchman peaks designated as a wilderness area by Congress. He will be joining us on most of our activities .